Water-Aide is an OMRI listed product that is acceptable for use by organic growers on all types of plants and vegetables. Water-Aide is a compound that forms a gel polymer. It traps water and moisture on targeted areas reducing the amount of plant waterings. Water-Aide is a combination wetting agent, soil penetrant and drift retardant. Water-Aide increases the efficiency of water. It helps water penetrate the soil with less runoff and allows water to spread evenly throughout the soil media. This enhances fertilizer and nutrient uptake. Simply mix 1/4 ounce of Water-Aide with five gallons of water. WaterAide is packaged in attractive 3oz. bags. 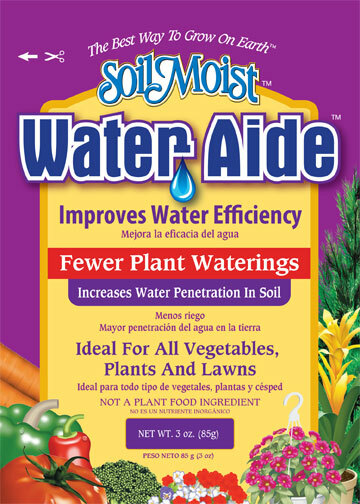 Each package will treat 60 gallons of water for your plants, vegetables and lawns.